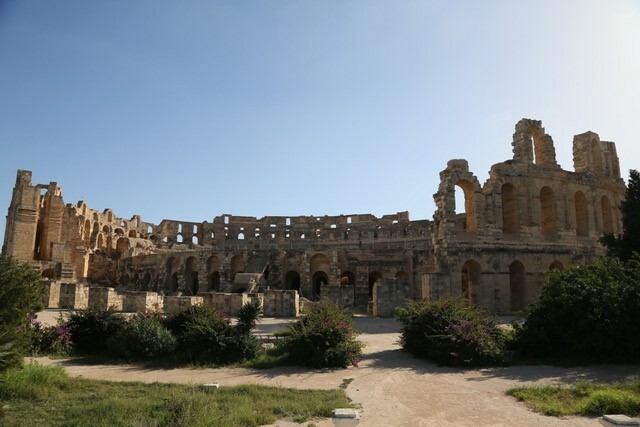 In December 2018, Tunisia’s Tozeur International Film Festival (TOIFF) invited a group of eight location managers to attend its first edition, followed by a scout of the country. Looking to revive its international filming industry, our attendance at the festival and tour were conceived as ways to encourage international filming in Tunisia once again. Samy Mhenni from the Tunisian Government explains “we believe Tunisia has many filming advantages for international film makers, its proximity to Europe, rich and different filming spots, professional technicians and production agencies just to name a few”. Six British location managers, David Pinnington (Guardians of the Galaxy, Game of Thrones), Peter Bardsley (Solo: A Star Wars Story, Fantastic Beasts and Where to Find Them), Tom Goad (Born a King, Horrible Histories: The Movie), Angus Ledgerwood (Electric Dream, Kong: Skull Island), Thomas Gale (Wannabe) and Tobin Hughes (Wonder Woman, Game of Thrones) were joined by two LA based managers; Michael J. Burmeister (Terminator Salvation, Suburbicon) and Michael Wesley (The Dark Knight Rises, Westworld). I flew out to the Tunisian desert with the group to cover the trip for The Location Guide. We would spend our first nights in the desert-oasis city of Tozeur, in south west Tunisia. Having previously provided a base for international blockbusters such as Star Wars and The English Patient, Tozeur is an excellent point from which to explore the location-rich region. Serviced by its own airport connecting flights between Tozeur and the capital Tunis operate daily. Spending our first few days at the festival provided a chance to meet members of the Tunisian production industry. We were able to see first-hand that not only is the domestic production scene vibrant, but due to the number of film schools in the country, skilled professionals are available. Production service providers also assured us that a base of equipment was on hand, while additional equipment can easily be shipped from France or Italy. And as we were to see, Tunisia has a depth and variety of locations available worthy of enticing large projects. On our first full day we explored Tozeur itself. Our first stop was the Head of the Source, a high point overlooking the city. Tozeur’s medina and the winding passages of its old quarter were quieter and of a less hectic nature those we would see in bigger cities later in our trip, but could easily cheat a big, ancient city. Looking inside one of the houses in the medina we found a large courtyard with more of the intricate brickwork seen on the streets, and ample space for productions. We also looked around one of the boutique hotels, or Dar’s that Tozeur has in abundance. Tunisia’s equivalent to a Moroccan riad, the hotel had a classic charm, an outdoor swimming pool within its compound and plush interiors perfect for stills photography. That afternoon we visited a smaller town called Nafta with quiet winding sandstone streets. Michael J. Burmeister thought these narrow walkways in both Tozeur and Nafta “had great production value” because they could be dressed for any time period. From Nafta we were led further into the desert, this time in jeeps through large dunes, until we reached the sets of Mos Espa, the fictional spaceport settlement located on the Star Wars planet Tatooine. Constructed for 1997’s The Phantom Menace the sets were revisited in 2000’s Attack of the Clones. A definite highlight for some of the group, we arrived as the sun was setting which only added to its appeal. Followed by a sunset party, we were able to look over the area's vast dunes. Michael Wesley noted that “it is good to know you have classic North African dune locations within striking distance to a hotel and city”. 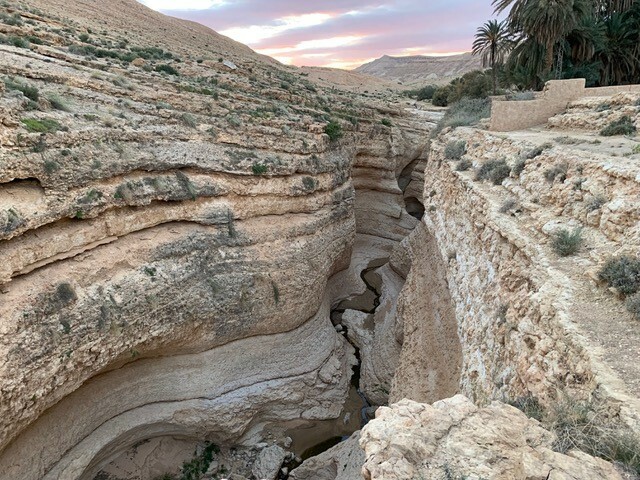 The next day we would see another prized location utilized by an international production, the impressive Tamaghza canyon (pictured below). Starring in The English Patient, we observed the canyon’s layered rock face and gently curved form stretching into the distance. While we only examined the canyon from above, Anthony Minghella’s Oscar winning movie shot down inside the canyon itself, which is wide and accessible enough for productions to explore. The winding roads between Tozeur and Tamaghza were a point of interest in themselves. The colour palettes and rocky valleys could easily play anywhere ranging from the Gulf States or Afghanistan to Mars-like scenes. The next morning, we would travel on another equally alluring, but distinctly different road. Taking us south, this long straight highway dissects the Chott El Jerid, a large salt lake. Pulling up next to an abandoned bus, a prop stuck in the flats after previous filming, Michael J Burmeister commented that “it gives you the perspective of how large the area really is”. David Pinnington agreed, arguing that “when dry this somewhat surreal landscape provides stunning infinity skylines in a clean, clear, flat, salt encrusted environment stretching for miles.” The main roads we travelled on in Tunisia were all in good condition, even in these remote areas. Thomas Gale, who works mostly for the commercial sector reflected that “these sorts of places would be ideal for car commercials as a shining brand-new Ford would really stand out here”. While we had previously ventured into undulating desert on the trip, our destination of Douz, is where productions looking for sand dunes with notable scale should head. Considered Tunisia’s gateway to the Sahara, Douz is a tourist destination with hotels and amenities. Due to time restrictions, we were unable to trek deep into the desert itself, but we were assured by the local production professionals that dunes as large as you can get in the Sahara are reachable. 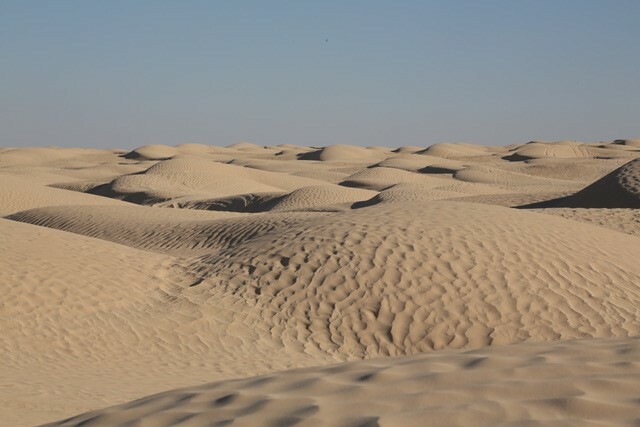 Peter Bardsley who has experience of working in deserts on big projects noted that “we saw the edges of the desert with small unspoilt dunes, and many of the Tunisian producers had filmed deeper in to reach the impressive scale wide shots. Having filmed in Jordan for the Wadi Rum previously, I would want to go that extra mile and see the Tunisian Sahara at its mightiest before passing an opinion”. From here, the last location of the day before we reached our overnight stop of Matmata, one of the traditional underground Berber houses that are dotted across the region (pictured above). Dug into the rock itself, these troglodyte homes have a central courtyard framed by cavelike rooms used for living. Quite unique, the houses inspired George Lucas’s vision for the homesteads on the planet of Tatooine. The next morning, we would visit a hotel in Matmata where Star Wars shot (pictured below). Remaining to this day, George Lucas transformed the traditional structure into a futuristic set. The versatility of these earthen homes struck Michael J. Burmeister as “unique one-of-a-kind locations. The nice thing is that they could play for the future as in Star Wars, they could also play for current day or they could be used in a period piece. Since the architecture is rather timeless that gives you complete flexibility to make it what you want to by use of set dressing”. On our fourth day in Tunisia, we continued south to the region of Tataouine, the original inspiration for George Lucas’s vision for the Star Wars planet. We made our way to the Hotel Ksar Hedada, a larger scale version of the Berber settlements with rounded earthen rooms connected by stone staircases. The Ksar played a Slave Quarter in Star Wars Episode I: The Phantom Menace. Alongside Star Wars, a common theme of the trip was the number of ruined, or deserted villages we were able to explore throughout the South. Kibili, Zrawa and Beni Zleten were all examples of these villages varying in scale, accessibility and views. After visiting the Hotel Ksar Hedada, we would see two more of these villages; Chenini (pictured above) and Douiret (pictured below). Located on a hilltop, Chenini sprawls upwards towards a white mosque located at the top. Arguably, the most impressive of the villages we saw Chenini is also probably the most suitable in terms of safety for large scale filming. The creative potential of the location was summed up by Peter Bardsley who assessed that “their instant biblical or fantasy feel and sprawling 360 panoramas” were truly stunning. Thomas Gale agreed arguing that “the views seemed pretty hard to beat, I can just imagine a cast member walking along the top and looking out over an invading army”. In addition, Chenini has a modern, inhabited village within view, served by a good road to make logistics for this spot straightforward. While surveyors would need to check these abandoned villages before filming, their potential spoke for themselves. The last stop, Doiret was similarly impressive, this time because of its vista. Rocky plateaus rising from the desert landscape (pictured below) immediately made me think of the American Southwest I’d seen portrayed in recent productions like Westworld or The Ballad of Buster Scruggs. LA based Michael Wesley also agreed that the landscape could double for areas of Utah, even, at first glance, down to the “Spanish Mission architecture (Mission Revival)”. For European productions, this would be a particularly cost-effective location stand in. The following morning, we changed orientation to head northwards. After a long drive we reached El Djem, a city which boasts the world’s second largest amphitheatre still standing. Much like the one in Rome, half of the amphitheatre is incomplete, but the other half is still in good shape and underground tunnels are open to the public. This architectural highlight is a boon to productions because, despite its size, tourist traffic is lower making it much easier to close than other comparable structures. Our last day in Tunisia began in the coastal city of Sousse. 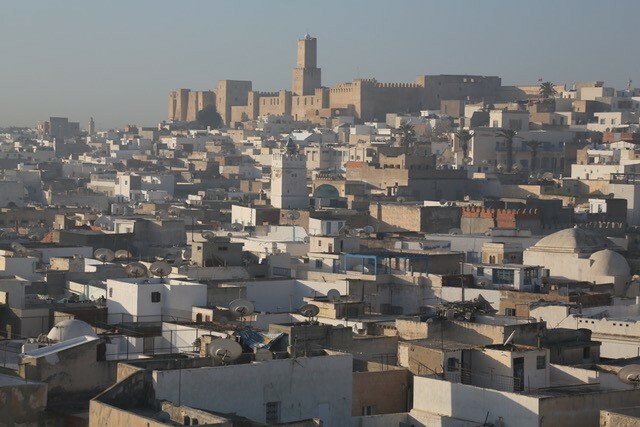 In addition to a busy winding medina, Sousse’s Ribat, is a location highlight. A solid military fortress, the structure could easily double for an ancient castle or fort and is completely intact. As we continued northwards on a two-hour drive to Tunis, the landscape noticeably changes to more agricultural farming land. We were told that, if we continued northwards after Tunis we would find a green landscape often referred to as “The Ireland of Tunisia”. In Tunis itself we investigated the coastal district of Sidi Bou Said (pictured below). Here, our first stop was the House of Baron R. D’Erlanger (pictured right). The large palatial house provides authentic period settings with intricate carved architecture, while the estate itself overlooks over a bay. As Peter put it, the district of Sidi Bou Said itself has a touch of the “wealth and beauty of an upmarket ‘Greek Island’”. Uniformly white and blue, its houses and streets could double for a Mediterranean coastal town, but its North African character is indisputable. Thomas Gale noted “the shock on blue on every building makes it all look much more cinematic. Mamma Mia 4, could shoot here, but really any film would look good”. Unable to explore more of the capital and other regions of Tunisia, we all left feeling that Tunisia had a solid selection of locations to warrant serious consideration. Being a cost-effective alternative to north African settings only furthers its potential. Moreover, the hospitality we received suggested that Tunisia would provide a film friendly environment for any incoming production. The Location Guide would like to thank The Tozeur International Film Festival and the Ministry of Culture for the hard work of all those involved who made the tour such a great success.